This article caught my attention from a tweet by SAE on the debut of Volvo’s new diesel engine. 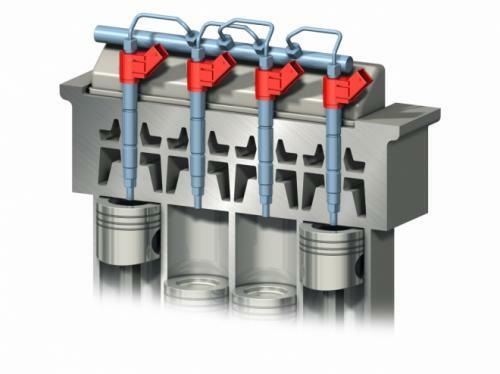 The main advancement described in the article is a more accurate closed-loop control system for fuel injection that includes a pressure sensor in each injector rather than just a single high-pressure rail sensor. Fuel consumption of the new engines is reduced by 10-30% compared to units of similar output but of larger capacity, Crabb claimed. Denso engineers have stated that i-ART can improve fuel efficiency by 2%, compared with open-loop systems. So is this a truly revolutionary improvement or another small incremental step? It is unclear from this quote, but my guess is that under certain conditions, they are improving efficiency by 2% – sometimes. So if you start with 40 mpg, this system could improve it to 40.8 mpg under certain conditions. Of course this is only a guess. Something else that I found very interesting is that they are using ball bearings for the cam shafts. This can clearly have benefits on reducing friction, but ball bearings have always been avoided on engines due to a lack of load capacity and longevity. I wonder how they are solving this problem! Knowing Volvo, I am sure that these bearings have been tested six ways to Sunday. Interestingly enough, in our first CCI prototype we used ball bearings as main bearings because we were not overly concerned with longevity in that lab-only prototype. New Team, New Office, New Engine. Some big things are happening at Motiv Engines! As the title says, we have a new team of engineers, a new office in Midtown Manhattan, and a new engine design. I will introduce the engineers to you soon. The engine itself may take a while before I can give details, but I can provide some key ideas behind it. We get possession of the office on September 1, and I’ll give a little online tour of it after it is up and running. With our first prototype we did not run into any thermodynamic surprises, but we did have some issues related to the mechanism. There are several things that we are doing mechanically different than the norm, and some of these things proved tricky. When we modified our thermodynamic simulation to include the mechanical things that were going wrong, the results perfectly matched our experimental data. This gave us even more confidence that our theory is strong, but the mechanical implementation was lacking. So now we have a new design that addresses all of those issues. It should be vastly simpler to build, assemble and maintain, and believe it or not, it will be even smaller. Thermodynamically it is exactly the same. In mid-September the new team will begin detailed design of the new engine. We hope to have the new engine in a test cell having produced data in less than a year. It is a very exciting time!